A senior U.S. military official told CNN that the U.S.-led coalition in Iraq and Syria has killed roughly 50,000 ISIS militants over the past two years. 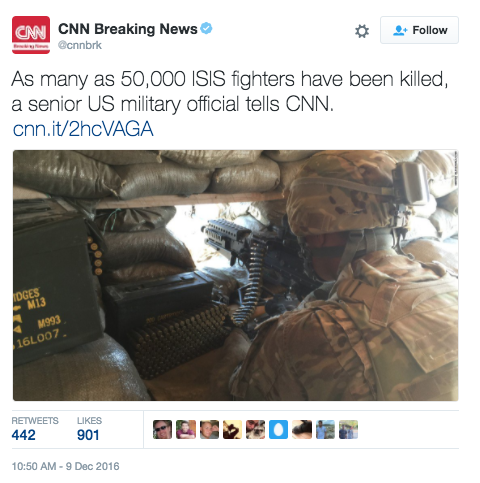 According to CNN, ISIS recruitment has also been on the decline, only recruiting several hundred foreign fighters per month as opposed to the few thousand each month previously. The official went on to say that the figures were a “conservative estimate,” and that other officials have refrained from giving any specific numbers in the past due to ISIS’ ability to spawn new militant fighters in such a short amount of time. Lt. Gen. Sean MacFarland had previously stated in August that the coalition had successfully removed about 45,000 militants from the battlefield. “I credit them for being so resilient,” a senior military official told Fox News about ISIS. He added that as airstrikes have been the means used to kill so many fighters, U.S. officials remain fearful that ISIS may go underground. The official said the group could morph into something called “AQI 2.0” which would be another version of Al Qaeda in Iraq.